Conquer my fear of rejection by the ladies. 1. Establish communication with at least three ladies before I can go home. Her: Hey, do you smoke? I don’t but my friend here needs a cigarette. Lady: (I forgot what she said) Are you military? Me: oh cool, what do you do? Lady: I’m military police. How old are you? Bonus approach: As I’m sitting next to the fire, someone behind me keeps bumping into my chair: oh it’s a drunk guy. Drunk guy: hayyy whats your favorite movie??! Drunk guy: (pauses) okk, whats another favorite movie? Drunk guy: ok? ok? (visibly struggling to think) ok you uhh need to sit here andddd uhhhh thinkk about your favorite movie mkay?? Somehow he introduces me to his two lady friends, Sicari? and Emma. Sicari is southeast asian, perhaps from Indonesia? Emma has fair features. Both are cuties. 1am pizza with drunk guy and cute friends? I decline. In retrospect, I should have gone. Me: hi hows your evening? She works in retail. I tell her I’m a computer nerd. We watch people struggle to ride the mechanical bull. I decide to go ride it. The lady operating the mechanical bull is really pretty. She’s petite and has tattoos across her chest. Me: How much is it to ride the bull? 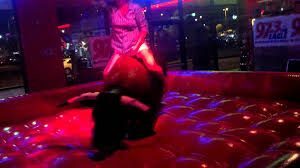 Bull lady: It’s $5 and you can ride all night. (guy next to her): If you tip her, she’ll go easy on ya. Bull lady: People think that I get the $5 but I’ve only made $6 in tips tonight! Well yea, your job can literally be performed by a monkey. But whatever, I tip her $5. She puts a bracelet on me after I sign a waiver, presumably about not suing if I break my neck. I get on the bull. She starts moving the bull around in circles. Boring. I give her a thumbs up sign. I think she thought that meant go psycho and starts making the bull buck left, right, sideways, diagonal: I fall off. Me: have you ridden the bull? Me: heyy, how are you guys? Me: have a good night! I see an old lady prancing around selling pink roses. I buy one from her and give it to Approach 1 lady. We say bye. Notes: Do not approach lady if her cell phone is out. Can I please purchase my domain name from you? hi Leigh, absolutely, do you have an email I can send you the auth code? Yes. (removed so you dont get spammed) So you really got rid of your phone and internet, huh? Kinda, ok I’ll send the auth code to that email. You just need to enter the code at your registrar and then it’ll be yours.